ConKerr Cancer One Pillowcase at a Time! 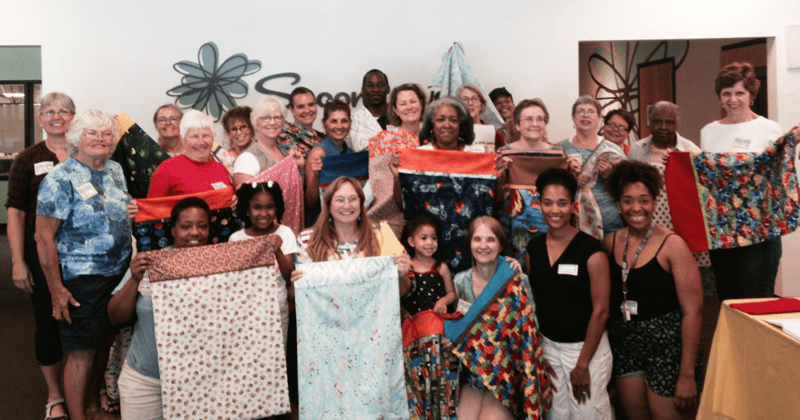 This past weekend, our amazing community joined us in the Greenhouse, our craft and community space here at Spoonflower's Durham, NC HQ, to whip up pillowcases for our local chapter of ConKerr Cancer. These lovingly crafted pillowcases will brighten the days of children facing extended stays in local hospitals. Volunteers in the Greenhouse show off their lovely pillowcases! In just three hours last Saturday morning, our merry team of volunteer sewists finished 68 bright and beautiful pillowcases! Thank you so much to Pam and Kim, our local chapter organizers, and to everyone who came out to sew for such a great cause! For more photos, check out the Spoonflower Greenhouse Facebook page. [Read more…] about ConKerr Cancer One Pillowcase at a Time! 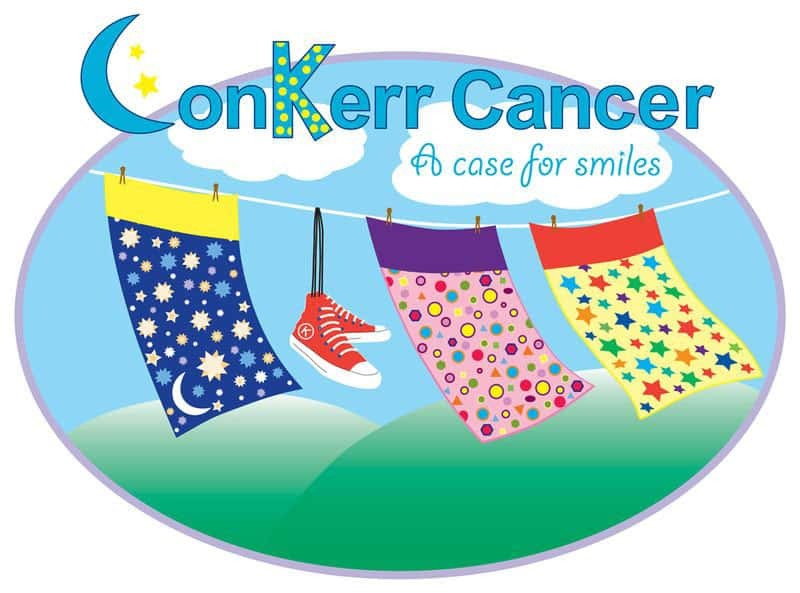 ConKerr Cancer is a national organization that brightens the days of seriously ill children facing extended stays in the hospital by providing them with their own beautifully handmade pillowcases. 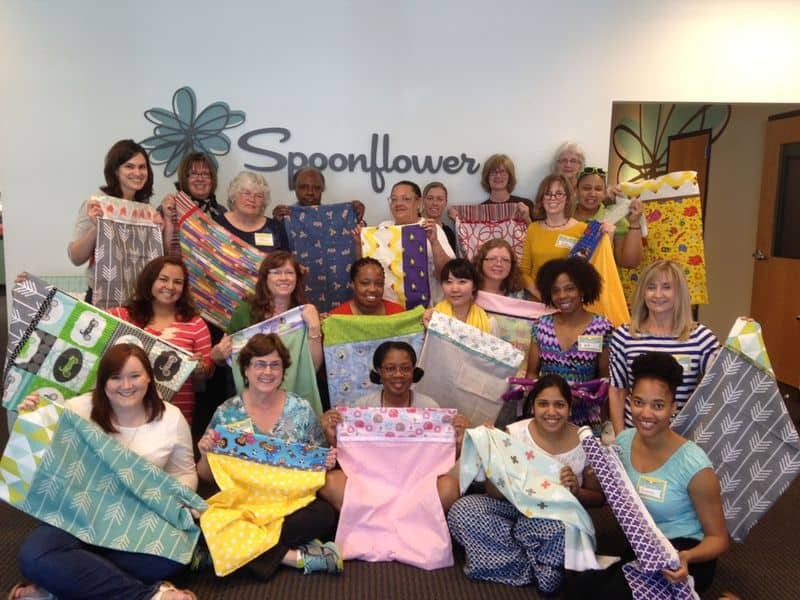 We are delighted to host a ConKerr Cancer Pillowcase Sew-In in the Spoonflower Greenhouse, our classroom and community space here at our Durham, NC headquarters on Saturday, June 13, from 10am-1pm, and we invite you to join in the effort, no matter where you are! If you happen to find yourself in Durham on Saturday, June 13, from 10am-1pm, please do join us in the Greenhouse to sew pillowcases for children in local hospitals! Head over to our event page for full details and to RSVP today! We'll provide fabric and notions for folks to create fun pillowcases to donate to our local chapter of ConKerr Cancer! If you'd like to make pillowcases ahead of time, or if you'd like to organize your own pillowcase sew-in to support local hospitals in your area, follow this quick and easy tutorial provided by ConKerr Cancer. Information about supporting ConKerr Cancer in your area can be found here, along with great resources and instructions for all of the ways you can contribute to such a worthwhile effort. If you're planning an event to support ConKerr Cancer in another area, please do let us know in the comments below. We love sharing fun sewing events with our community! We look forward to sewing for a great cause with you!